Marie-Laure lives with her father in Paris near the Museum of Natural History, where he works as the master of its thousands of locks. When she is six, Marie-Laure goes blind and her father builds a perfect miniature of their neighborhood so she can memorize it by touch and navigate her way home. When she is twelve, the Nazis occupy Paris and father and daughter flee to the walled citadel of Saint-Malo, where Marie-Laure's reclusive great uncle lives in a tall house by the sea. With them they carry what might be the museum's most valuable and dangerous jewel. "I think I have found my favourite book of the year" was the thought that entered my mind as I reached the end of this book. 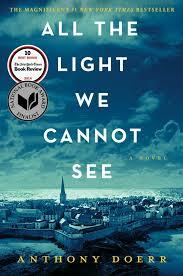 All the Light We Cannot See by Anthony Doerr is centered around a fateful day in Saint Malo and the series of events that brought together the two characters, a blind French girl Marie-Laure and a German orphan Werner. Interwoven into their tales are the hunt for a magical gem, the radio transmission of a voice from long ago and the madness of a terminally ill Nazi officer. As far as the reading experience goes, this prose within this book is absolutely stunning. With its short chapters and attention to detail, it gave me the nostalgia of a children's tale. Alternating between the past and the present, the events are slowly laid out like a jigsaw puzzle - piece by piece in an almost maddeningly way. It's not until the later half of the book that the pieces start to fall in place and you come to appreciate how everything that has occurred in their lives have led to that point. Following Marie-Laure and Werner as they grew up in their respective settings, it is easy to see how their surroundings and the war have shaped them into who they ended up becoming. Both characters are wonderfully fleshed-out and highly relatable. You cannot help but rejoice in their triumphs and share in their sorrow. This book also gave me an opportunity to learn about an event in World War II that I didn't know much about. This book contains a heavy dose of bittersweet. Like life, there are some events that you cannot foresee and often things do not have a neat little ending. Without revealing too much, let's just say my heart ached for both main characters at the "what-could-have-beens." Of course, it couldn't be a World War II novel without detailing some of the ugliness of the war. While most of the elements worked wonderfully and are interwoven seamlessly into the story without any notice, one particular event towards the end of the novel stood out to me as especially jarring. While it was downplayed as much as it can be, the event definitely jolted me out of the tranquil story-like atmosphere that the rest of the novel created. Even now, looking back, I'm not sure how much of a role that event played in the whole scheme of things which makes me wonder was it really necessary to add it in? All the Light We Cannot See is an absolutely amazing book. The prose is beautiful, the setting amazingly detailed and the story enchanting. I can definitely see why this book won the Pulitzer Prize of Fiction this year. I would highly recommend this novel for everyone to have a go. Great review. This book has been on my TBR list since it came out. I can’t wait to read it.